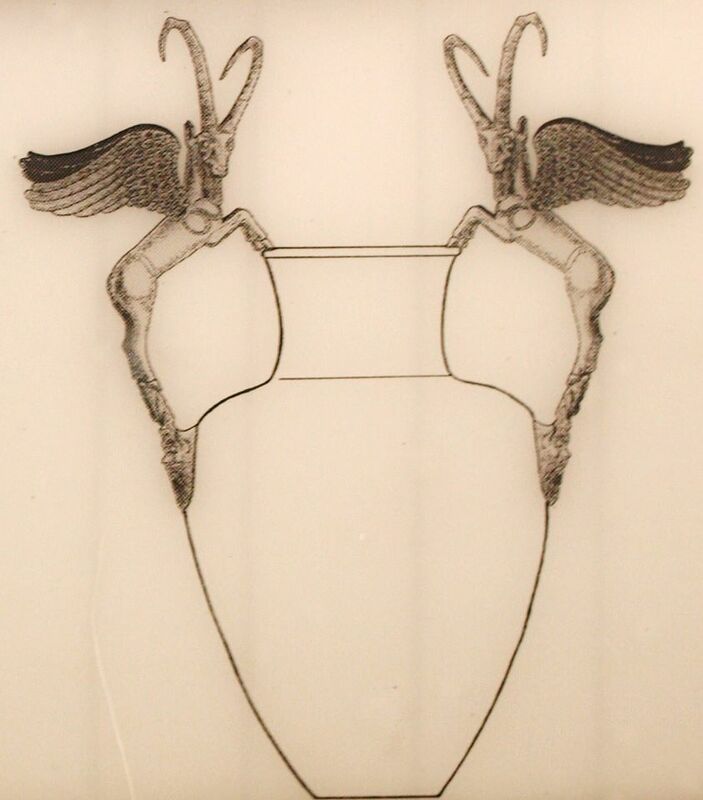 Vessel handle in the form of a winged ibex. The handle forms the boy of a winged ibex standing on its hind legs, its forelegs drawn, and its wings outspread as captured on the leaping position before soaring. The real species, the ibex, is easily identified due to the large ringed horns surmounting the head. 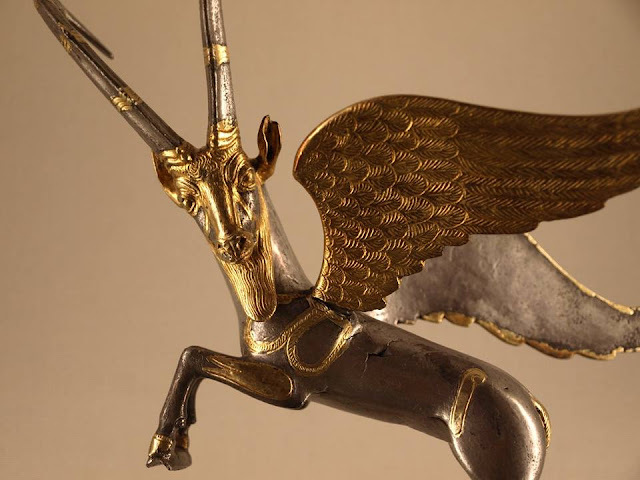 Ibexes played a major role in Iranian and Mesopotamian art. They can be found in the earliest decorated ceramic examples in friezes, as a symbol of power, might and sovereignty. In pre-Islamic Iran, ibexes were a source of meat, horn and hide and it was popularly hunted. This was not exclusive for the Iranian areas, but also spread to the regions under the influence of Elam, Assyria and Babylonia. 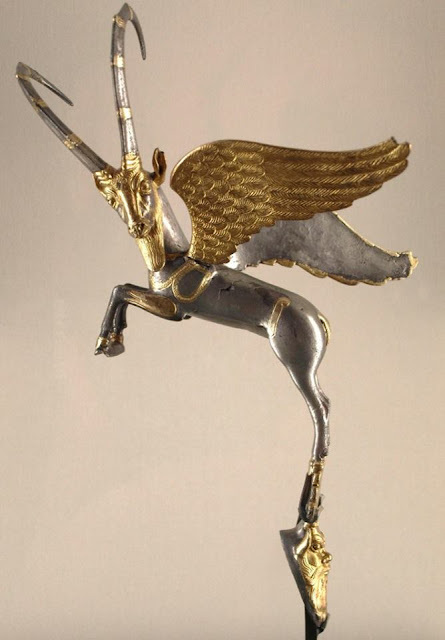 Its religious meaning, however, remains unclear, being the most clear connection the Zoroastrian deity of Victory Verethraqna, which appears before Zarathustra in the shape of a wild goat that could be interpreted as a male ibex. The hind legs are resting on the head of a bearded old man with long ears, coiffed with a row of palmettes. According to Roman Ghirshman this figure could be identified with the Egyptian god Bes or the Greek Silenus. Bes was a deity worshiped as a protector of households, childbirth and mothers. Silenus, on the other hand, was the foster father and tutor of Dionysus. 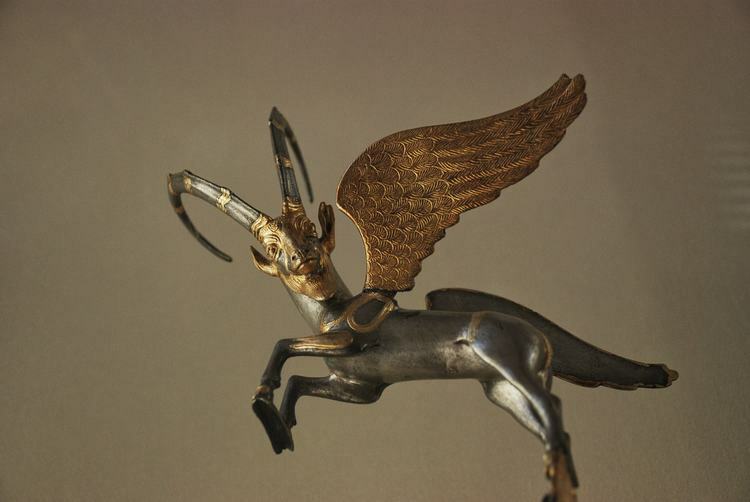 This handle in the shape of a winged ibex would have belonged to a metal vessel which would have had a second ibex symmetrically placed opposite it. The vessel would have most probably been in the shape of an amphora with a fluted body. This kind of recipient was highly prized among Iranian craftsmen and has important influences form the Greek art and the Iranian tradition of the terracotta animal-decorated vessels. Workshops producing this type of artefacts were dispersed through all the empire and not only in the central provinces, although they followed the models imposed by the authorities and the ruling trends. The incredible and fine details on the body, wings and horns of the creature is achieved by use of a technique known at least form the 3rd millennium BCE called lost-wax or cire-perdue. It is a method of metal casting in which molten metal is poured into a mould that has been previously created using wax. The wax melts and is drained away once the mould is completed. Vessels with handles in the form of fantastic beasts or real animals can be found all along the archaeology of both Iran and Mesopotamia, since the zoomorphic decoration was a widespread feature in Iranian art. The fluted body of the vessel this handle would have belonged to was characteristic of the Achaemenid metal vessels, which had its precursor on terracotta vessels dating back to the 2nd millennium BCE. Animals featured importantly through all the Achaemenid artistic examples, not only vessels but also reliefs, gold pieces, offerings and textiles. Some examples can be found in the friezes of the Apadana of King Xerxes (486-465 BCE) at Persepolis, where lions, bulls and horses represent royal tributes from the twenty-three provinces of the empire, but also symbols of eternal kingship and heavenly glory. The Achaemenid dynasty developed a fine taste for precious metal vessels with animal decorations in the round, sometimes adorned with precious stones. AMANDRY Pierre, "La Toreutique achéménide", in Antike Kunst, n 2, 1959, Allemagne, pp. 38-56. BENOIT A., "Les civilisations du Proche-Orient ancien" in Manuels de l'Ecole du Louvre, Art et Archéologie, Paris, Ecole du Louvre, 2003, pp. 466-467, fig. 255. CONAN J., DESCHESNE O., Le bitume à Suse : collection du musée du Louvre, Paris, Editions de la Réunion des musées nationaux, 1996, p. 323, fig. 393. POTTS, D. T., “Ibex, Persian ii. 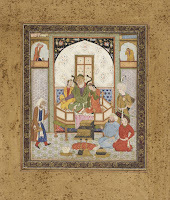 In pre-Islamic Art and Archaeology”, Encyclopaedia Iranica, online edition, 2012.